This is a gorgeous oversized volume featuring direct scans of some of Jim Lee's more iconic images from his time with Wildstorm and DC. I have been a fan of Jim Lee's artistic abilities since his early days with Marvel (How much do I wish there would be a similar volume published of his Marvel stuff? A lot. I wish that a lot. ), so to have a volume that is basically full-sized scans of his original artwork is amazing. Some of my favorite moments from Lee's Wildstorm days and some of his most iconic Batman images are included here. 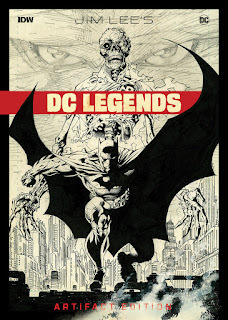 If you're a fan of Jim Lee, this is an absolute must-have for your collection.